A trouble-free solution which allows the user to transfer multiple contacts from CSV lists to VCF file in bulk. 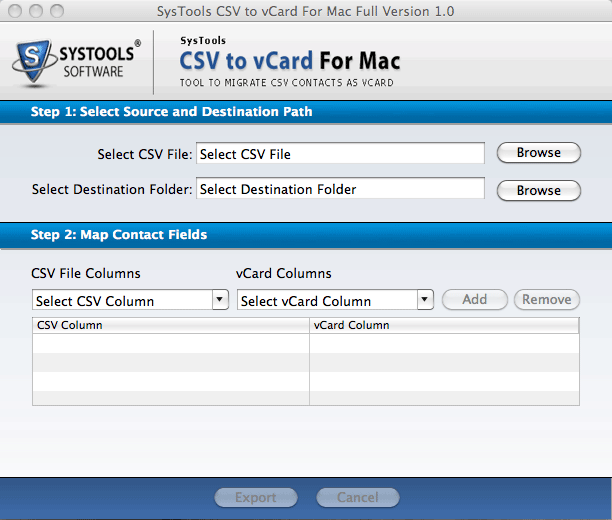 Moreover, it is compatible with Mac OSX v10.6 and all above editions while importing CSV file into vCard business cards. 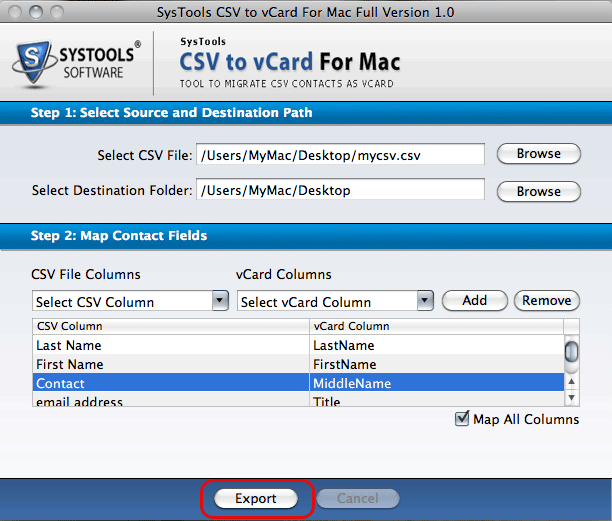 With this software, users can manually map all the columns of CSV file with vCard by default. Yet, if users want the software for mapping each column and field of contacts, then clicking on the "Map All Columns" option. This unique feature helps the user to map all fields without any hassles faced. While converting the data of CSV file to VCF for Mac, there can be no loss of personal information involved. The software can maintain multiple email addresses, complete address information, different phone numbers, and all other details remain the same. Also, it has a simple user interface that can be used by novice users easily. There is an option provided by the software to give contact field mapping while converting .csv (comma separated value) file to .vcf (vCard). 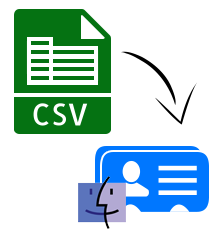 Users can select the columns of CSV files and the corresponding field of vCard contacts as per their choice. The software is capable enough to save the selected details in the respective fields. I don't have Outlook application on my computer system. Will this CSV to vCard file converter work without installation of Outlook or not? 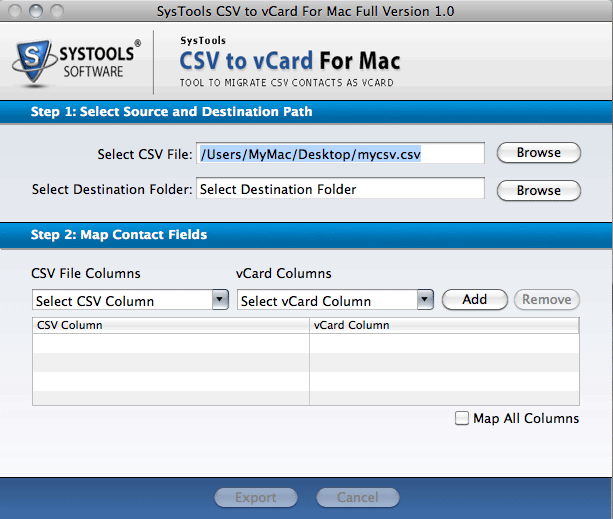 Yes, CSV to vCard conversion tool is standalone and it does not require any other application to support its working. 2. I have created a new .csv file of 200+ contacts. Does this software capable to export all contacts at a time? Yes, the software can easily move .csv file of any size. There is no such restriction within CSV to vCard converter tool. I want to know that Can I open converted VCF contacts in MS Outlook 2013? Yes, Of course, after conversion, all the contacts are saved in vCard file format, which can be opened in any Outlook version. "CSV to vCard Converter is one of the best solutions that I have come across. I was thinking to transfer all contacts between different platforms easily, for which I had to export CSV address book to VCF file. This amazing tool helped me to complete the conversion process without any fear of data loss. Moreover, it has a very interactive and user-friendly interface. Thanks a ton developers!!" "Being a non-technical person, I do not have the knowledge to convert multiple contacts from my CSV file to vCard with just a few clicks. I was completely hopeless to find a suitable tool which can execute it. Luckily, I found this CSV to VCF conversion tool. I have used it and realized that it can resolve all my problems. I am highly impressed with the performance and scalability of such a tool!!"